Reykjavík, Iceland—Project Legion, we hardly even knew ye’. The PC-centric first-person shooter CCP unofficially-officially announced two years ago is now unofficially-officially dead. Not that you’d necessarily notice, because a new PC-centric first-person shooter has stepped in to fill its shoes. Thursday at EVE Fanfest 2016, CCP unofficially-officially announced “Project Nova.” It’s the heir-apparent to Project Legion, which itself was the successor to almost-dead-PS3-exclusive Dust 514. The broad strokes are pretty similar. Project Nova is a free-to-play shooter that draws from the EVE Online universe, set in a future New Eden. It’s hard to say how much that will actually factor into the game because, you know, multiplayer shooter. But I expect it’ll be similar to EVE Valkyrie, which used the lore for flavor, mostly. “This has to be a great shooter, before anything else,” said Árnason. So how does it play? Because yes, it’s playable—which is more than could ever be said about Project Legion. Earlier today we had a brief hands-on with a super-early version of Project Nova (I’m not even sure CCP would call it “Alpha” yet). And by brief, I mean I played two rounds of a node-capture mode, similar to King of the Hill/Crazy King. There’s only one map at the moment, set in a massive hangar. Matches are six-on-six, which seems a bit sparse for the size of the map. The objectives give teams enough direction to fuel conflict, but if you get lost or separated from the group you’ll be off on your own for a while. It’s a class-based shooter. I spent most of my time playing as a Vanguard—a semi-heavy assault trooper with two high-volume SMGs. Classes in the demo are your standard assault/sniper/shotgun/heavy for the most part, though equipment varies—the “Cloaking-and-Shotgun” class proved pretty popular in our tests. What’s missing from this demo however is any sense of the big picture. That’s a shame, if only because a fair number of people are going to get their hands on the game this weekend and...well, at the moment it plays pretty much like an amalgamation of other shooters. The ultra-clean look of the new Unreal Tournament. The shooting and movement of late-era Halo. The class system of a lightweight Battlefield. “This has to be a great shooter, before anything else,” said Árnason. Which is all well and good. There's no use making the same mistakes as Dust 514, and it’s safe to say Project Nova needs to be a decent shooter first and foremost. 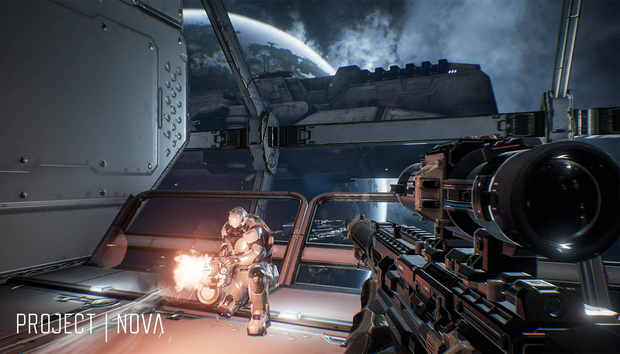 There are much grander plans for Project Nova though—plans that don’t at all come through from this little arena shooter demo. The long-term vision for Nova is to get back to the Dust 514 dream, blending Nova together with EVE Online. Not in real-time, per se. Árnason says that only “one percent of one percent” of EVE Online players ever used the real-time feedback aspects of Dust. But the idea of the Planetary Conquest mode, wherein corporations battled for control of planets, is something Árnason wants to resurrect in Nova—and more. It’s bottom-up development, and talking to Árnason it seems like this is the opposite of Dust—a game that seemingly started with a grand plan but could never nail down the details. The downside: The demo here at Fanfest is not nearly as inspired, mainly because none of those big-picture details are in yet. Which is not to say it’s bad. It’s not! It’s a perfectly fine twist on the arena shooter. But it’s clearly early days for development, and I have a feeling plenty of people will walk away from Nova this week feeling like it’s lacking a hook, a standout feature, not realizing that those are on the long-term roadmap. The dream of a Dust 514 on PC is still compelling. As someone who can’t bring himself to play EVE Online but enjoys shooters, I’d love a more palatable means of interfacing with that universe. A lot of pieces need to fall into place though, and in this case CCP’s newly conservative approach to development—where games need to prove their worth from concept to prototype to “Project” phase to greenlit project to eventual release—may hurt a game like Nova, which has a grand vision but can’t necessarily communicate that to players without an astounding amount of up-front work. Point being: If you see Project Nova footage and you think “Well, that just looks like a generic arena shooter,” you’re not wrong. The surprise is that’s exactly what CCP wants at the moment—because if you think it looks like a competent shooter, then it’s already avoided the biggest of Dust’s problems. The universe-spanning vision can come later.